Three days after the Supreme Court threw out terrorism convictions against Yameen's political opponents, his government on Saturday was still ignoring international and domestic pressure to set them free. Male: Maldives President Abdulla Yameen fired his second police chief in three days and the opposition said it feared violence, as the island nation was pitched deeper into a crisis caused by Yameen's failure to obey a court order to free jailed opponents. The court dismissed cases against nine people, including former president Mohamed Nasheed, the country's first democratically elected leader, who now lives in exile in Britain and has been campaigning to have his political rights restored. One of the others also lives in exile; the other seven are jailed in the Maldives' largest prison, on the island of Maafushi. Hundreds of protesters have taken to the streets to demand compliance with the court order, and Western countries and international organisations have urged Yameen to obey it. The court also ordered 12 members of parliament who had been stripped of their seats to be restored to the body. The 12 had quit Yameen's ruling party last year, and allowing them to return to the legislature would deprive him of a majority. The crisis poses the biggest threat to Yameen's control of the Maldives since he took power in 2013, defeating Nasheed in an election that Nasheed's supporters say was rigged. Yameen has stopped short of saying he will not obey the court order to free his opponents. He told a party meeting on Saturday he "did not expect the Supreme Court ruling at all". "We've started dialogue with the Supreme Court. We've sat and started talking about difficulties or concerns the state has," he said. "We're working on making sure we can respect the court order in a way that doesn't cause any difficulties to the people." He fired the chief of police on Thursday shortly after the court order was handed down, and on Saturday he fired the acting police chief he had chosen to replace him. The director of the Maafushi prison also resigned his post on Saturday amid disagreement among staff over whether to release the opposition leaders, an official at the Maldives Correctional Services (MCS) told Reuters. An MCS spokesman was not immediately available to comment. Hundreds of opposition supporters chanted slogans such as "Enforce the Supreme Court ruling," and "Defend the constitution," in a Friday night rally outside the opposition MDP campaign centre in Male, the capital. The joint opposition said in a statement it was "deeply fearful that the government's refusal to implement the Supreme Court order could escalate to unrest and incite violence across the country." 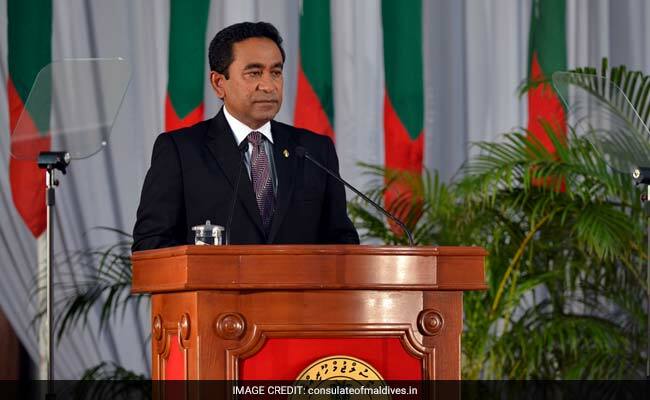 The Maldives, an Indian Ocean island chain of around 400,000 people known to outsiders mainly as a tropical paradise for the tourists that provide most of its foreign exchange income, has experienced political unrest since Yameen took power. Yameen is the half brother of Maumoon Abdul Gayoom, who ruled the Maldives for three decades until losing an election to Nasheed in 2008. Yameen and Gayoom have since had a falling out and Gayoom is now aligned with the opposition. Parliament Secretary General Ahmed Mohamed told Reuters that parliament intended to reinstate the 12 legislators as required by the court. He also said Speaker Abdulla Maseeh Mohamed had asked to cancel this year's opening session of parliament scheduled for Monday, citing security reasons. The United Nations, the United States, the European Union and India have urged Yameen's government to follow the court ruling. "We understand the situation is extremely tense," Rupert Colville, a spokesman for the U.N. High Commissioner for Human Rights, told reporters on Friday.